The Koh Phi Phi Manta Ray is a sight to behold but not one that can experienced regularly. The manta are nomadic and appear at certain times of the year on their migratory paths which happen to be close or near some of Koh Phi Phi's key dive sites. 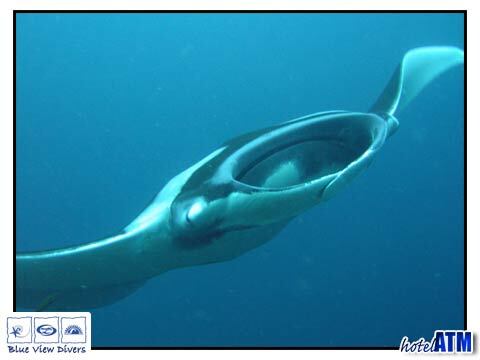 The Koh Phi Phi Manta Ray are the Reef Manta Ray (Manta alfredi) and the Giant Oceanic Manta Ray (Manta birostris). Around the Phi Phi Dive sites they can be as large as 5 meters or 15ft wide. Oceanic mantas live in deep water in the 'pelagic zones' but visit 'cleaning stations' at seamounts and coastal reefs. The Phi Phi dive sites of Hin Daeng and Koh Bida are examples of such reefs and, in season, can be seen. Koh Phi Phi Manta Ray are there to be cleaned! In close to the reef these 'cleaning stations' act to keep them healthy. Commonly wrasse, remora, and angelfish feed in and out the manta's gills. They also groom and feed the skin usefully removing parasites and dead tissue. At these cleaning stations they swim around in circles to bring the cleaners in and then tend to stay until the process is finished. This means that if the Manta Ray is not spooked by divers they can stay with the dive group for some time. At Koh Phi Phi, Manta rays are filter feeders. Mantas consume plankton, fish larvae and the like. They strain the food from the water passing through their mouths and out of their gills as they swim. Typically mantas eat and go through 20–30 kilograms (44–66 lb.) of plankton per day. Manta Rays around Koh Phi Phi are in the range of 2m - 5m but the most common are 3.5m wide from wing tip to wing tip. These huge and yet graceful creatures glide, fly through the water in an effortless flow. The main place to see the Koh Phi Phi Manta Ray is at Hin Daeng, one of the best dive sites on the islands. Hin Daeng is a rock that protrudes to the surface at low tide. This massive pinnacle rock is on the edge of a ledge so that the shallow side is 30 meters deep and the drop off is 60 meters deep. 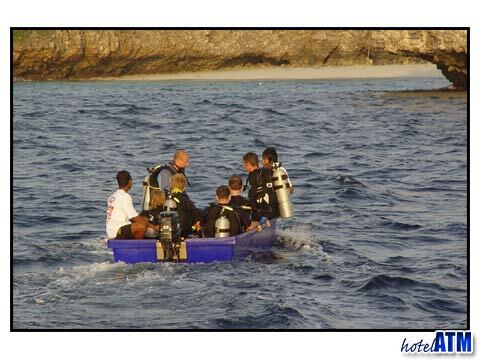 With excellent visibility up to 40 meters this is a dive site for the experienced in controlling their depth. Hin Daeng provides an ideal cleaning station for the Manta Ray as it enjoys a wealth and flourishing marine ecosystem and is far from land. It is a long and exposed 45 minute speedboat trip from Koh Phi Phi so the decision to dive is greatly affected by weather conditions and sea state. Phi Phi Hin Daeng also enjoys the visits of whale shark and so on a lucky day you can experience Manta Ray, Whale Shark, and assorted reef shark. It truly is an exception dive site. The Koh Phi Phi Manta Ray is spotted more rarely close into the main islands of Phi Phi and primarily at Koh Bida and the deeper west coast of Phi Phi Ley. Koh Bida can be used as a cleaning station but the west coast of Phi Phi Ley they are more likely to be swimming through. Diving to see the Koh Phi Phi Manta Ray is mainly organised by the dive schools centred in the main Phi Phi Don Village. If you are staying in the north of Phi Phi Don at the luxury hotels then it would be best to work out the Hin Daeng Dive trip in advance.